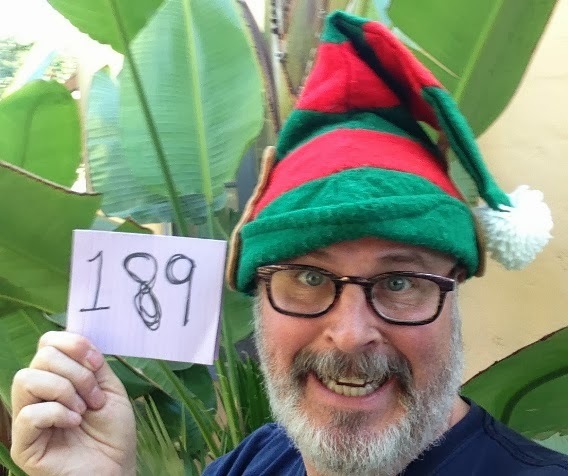 Day 189 / Hat 189: Green- and red-striped elf cap with white pomp-pom on top and beige pointy ear detail on each side. Interior is green (rayon? nylon? who knows) with tag that reads (I'll spare you the all caps): "Do not wash or dry clean, spot clean only. Not a toy, for decoration only. Made in China." You can watch it below or click here to read a transcript of the sketch -- in my opinion it ranks among the funniest of the shows many, many Christmas sketches.